Shaun Thomas is an artist hailing from the surf-drenched shores of Southern California. His clean lines and use of mixed media draw the viewer into masterfully crafted worlds, borne of his rich imagination. Shaun is well traveled and spends his time out of the art studio in his own web studio, creating digital experiences for a range of clients. 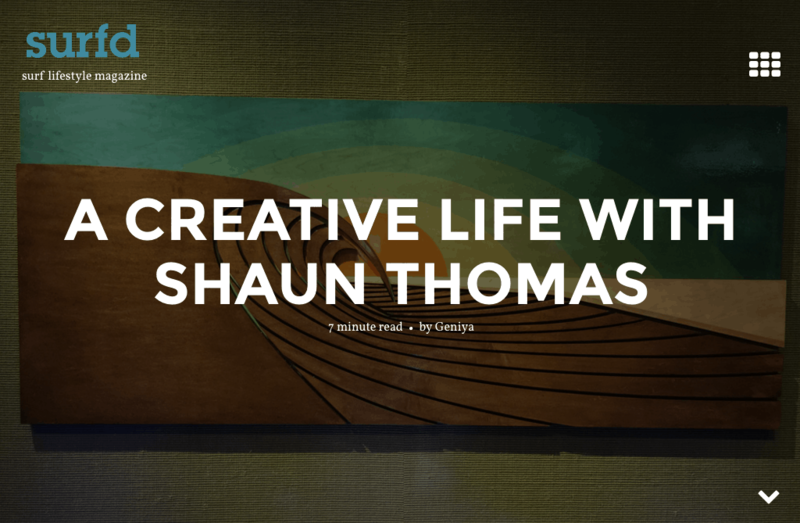 Shaun has created an amazing life and lifestyle, which serves as a model for creative people everywhere. We hope you enjoy his words and images. HEY SHAUN! HOW’S YOUR DAY GOING? Hey hey! Going great, just got back from picking up some of my art pieces at Wyland’s Studio Gallery in Laguna Beach, CA. I was featured during Augusts’ Art Walk and the gallery kept some of my artwork on display for a couple months. What an awesome gallery! I was really honored to get my work featured there. WE’RE BIG FANS OF YOUR WORK. TELL US A LITTLE BIT ABOUT YOUR PATH TO ARTISTRY. My path to artistry has been quite interesting. Fast forward to my third year in college, I was on my way to earning a Business degree, sitting through long lectures and endless assignments, focusing more on the social aspects of college (which was awesomely distracting) and found myself seriously questioning what I was going to be doing with my life. Mid semester I dropped all my classes and enrolled into a Career Planning course at a local Junior college. It was there that I realized creativity and design was at the top of my list – business was last. From there I returned to college, focusing on a degree in Communications with a minor in Graphic Design. I began enjoying all of my classes and doing really well. I decided to complete the remainder of my design classes studying abroad in Australia. Best decision ever! After graduation I traveled a bunch. I also accepted an abundance of freelance design work. Eventually I had enough clients to start my own Design agency, InDemand Web Solutions. Once I got the company on cruise control, I needed a couple of hobbies when the surf was down, which is where the creativity spark really ignited. My first project was restoring a 1968 mustang. I rehabbed the whole car and even added my own flare by designing my own gauges and added other customizations. I absolutely loved it. The challenge, freedom and enjoyment I got out of doing whatever I wanted to do on the project, without the limitations of someone else’s vision or critique getting in the way, gave me a glimpse of what I was really passionate about. From there I decided to build my own custom furniture, which spiked my interest with wood. The creativity caught like a wildfire and I began surrounding my home and environment with my own work which led me to creating my own art. Last November I submitted my first artwork piece into an art show in Laguna Beach, CA. The piece got great reviews and even sold. Looking back at it all, I was so busy and wrapped up in working on all my projects, that I never felt like an actual artist until I had my first piece showing in a gallery. Before then, I was just a guy experimenting with some fun hobbies. WE LOVE YOUR USE OF MIXED MEDIA IN EACH WORK – WHAT IS THE CREATIVE PROCESS FOR YOU? IS IT THE SAME FOR EACH PIECE OR DO YOU MIX IT UP? In all my works, I try to keep things simple, which is difficult to do at times. My process is very similar for all my pieces. To get inspired before I work on a piece, I look at a ton of imagery in magazines and on the web, picking apart different angles and sections from different photos. Once I think I have something worth while I’ll then draw it up on my computer. For one concept, I create multiple versions, mixing and matching them until I come up with one that is worth bringing to life. Next is the wood selection. I am very picky about the wood I select for each piece. A wood grain’s pattern can change the look of a piece. I cut out all the wood shapes using a large scroll saw and then sand them down to a fine finish. I’ll then tape off the design patterns applying different colored dyes and toners, keeping that wood grain as vibrant as possible. I’ll finish it off by adhering all the pieces and applying a finish of my choice, varying from satin to high gloss. While the high gloss makes the grain and colors pop, a satin finish keeps these wood pieces looking natural. Can’t decide which one I like better! IN ADDITION TO ART YOU ARE A CREATIVE DIRECTOR AT A WEB AGENCY – DO YOU FIND YOUR DESIGN APPROACH EXTENDS EVEN ACROSS TO DIGITAL MEDIA? I am actually the owner, creative director, UX and graphic designer. My web agency is rather small so I wear a lot of hats. It’s a daily challenge to brand such diverse companies and individuals, from local artist and small businesses to high-end corporate clients. It definitely keeps things interesting. Depending on the client, my design approach varies. I can typically get a good read if the client is going to be easy to deal with or a stubborn one. For those particular clients that are hard to deal with, that already have their minds set on their company vision, I approach the design as more of a service provider than an artist. I offer my expertise when I really feel it is necessary. Stating my point of view too heavily just makes things more difficult for both parties. Fortunately, I have a large number of clients who fully trust my judgement and simply inform me to, “brand the company as if it were your own.” Those are the fun design jobs. It gives me a greater challenge to impress, which is how I like to design. I set goals for myself, often times too many. I’ll then set a schedule for these goals before each week. Creating art is very similar to starting a business or staying in shape, as it’s important to stick to your schedule.When you have goals you are passionate about, motivation seems to come a little easier. Now don’t get me wrong, its not all “rainbows and unicorns” over here. I have made many sacrifices. I’ve had many long hard days and sleepless nights creating and building, when I’d rather be surfing or out with friends. But ultimately, I want to spend the rest of my days doing something I really enjoy. I finally feel that I am on the right track. That in itself, is motivating enough. IN THE WORLD OF ART, WHO DO YOU ADMIRE? Too many to list. Off the top of my head, Jaehyo Lee’s work is amazing and very inspiring. Upper Trestles is my spot. Used to surf it religiously. I’ll head down to Oceanside every now and then to get away from the crowds. As for my ride of choice, it would have to be a shortboard thruster. I seem to complain a lot about my boards lately but truth be told, I know its me, haha. …I just got so motivated. ANY WORDS OF ENCOURAGEMENT FOR ASPIRING CREATIVE PEOPLE? HOW CAN PEOPLE CONNECT WITH YOU TO SEE MORE OF YOUR ART?